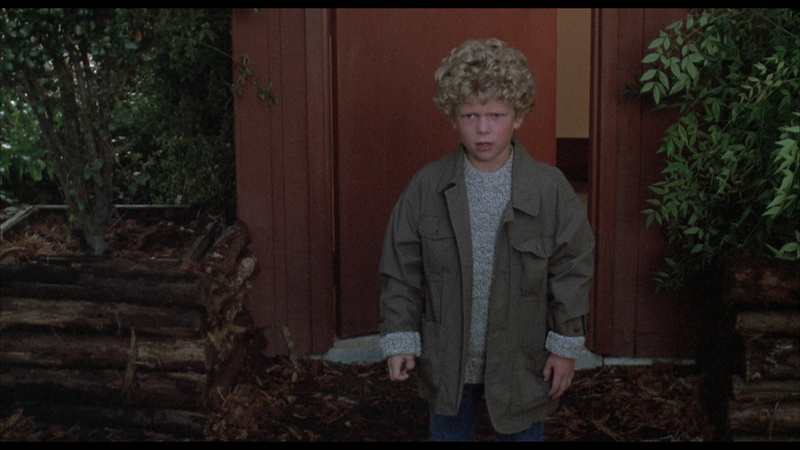 Though he only took a break from thrillers for eight years after his deliciously overripe Body Double, it felt like an eternity when Brian De Palma finally jumped back into the world of mind games and suspenseful trickery with Raising Cain in 1992. His four films in the interim had included one major box office hit (The Untouchables) and his biggest financial misfire (The Bonfire of the Vanities), so going back to thriller territory seemed like a surefire way of revisiting his roots and delivering the audacious provocations that had made him a household name. 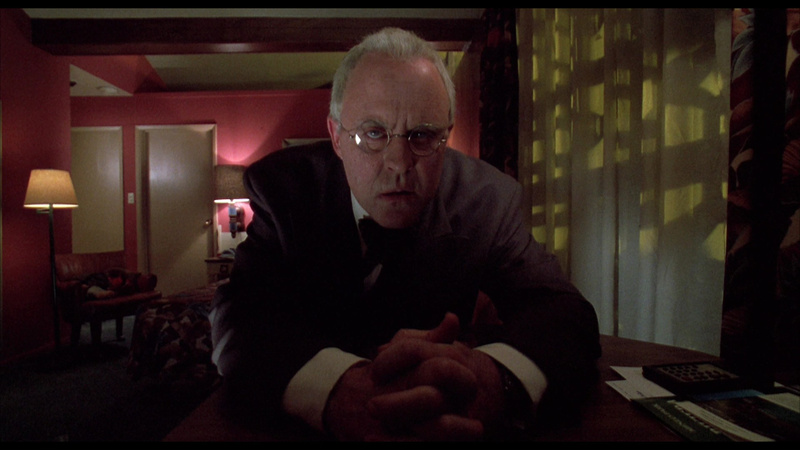 What he delivered instead was a shocker of a different kind, an extreme experiment in cinematic language that delights in tossing viewers upside down and all around for an hour and a half, all anchored around the most delirious performance(s) ever given by John Lithgow. The seemingly happy marriage of physician Jenny (Davidovich) and child psychologist Carter (Lithgow) appears to be ideal, especially since he's taken time off to be a full-time dad to their daughter, Amy. He also intends the process (monitored with cameras in their home) to result in a bestselling book or two, spurred on by the legacy of his controversial, deceased father, Dr. Nix, who conducted extreme studies in child split personalities in Norway. Jenny finds herself torn when a Valentine's Day shopping outing accidentally reunites her with Jack (Bauer), with whom she'd fallen in love while treating his dying wife years before. An impetuous decision to buy Jack a present as well leads to a turbulent chain of events involving kidnappings, murders, dream sequences, tormented backstories, vertiginous camera movement, and a dramatic rainstorm climax. 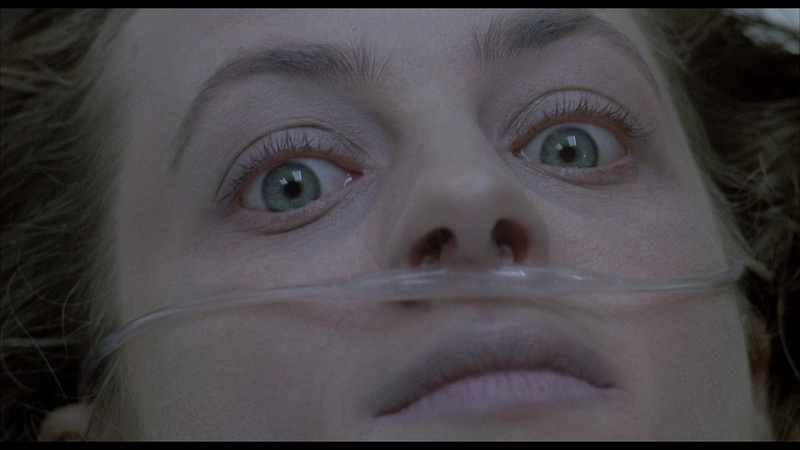 The basic mystery behind Carter's character is laid out right in the open right at the start of Raising Cain's theatrical cut, which bolts right out of the gate by bending reality back and forth so violently that viewers either fell in love with the experience or left the theater shaking their heads in confusion. Most true blue De Palma fans fell into the former category, with the director gleefully playing around with time and perception so radically that you're not even sure whether some characters are even real until the final ten minutes. He's also aided by yet another superb score by regular collaborator Pino Donaggio, which perfectly mirrors the heightened emotions and complete lack of realism on screen. 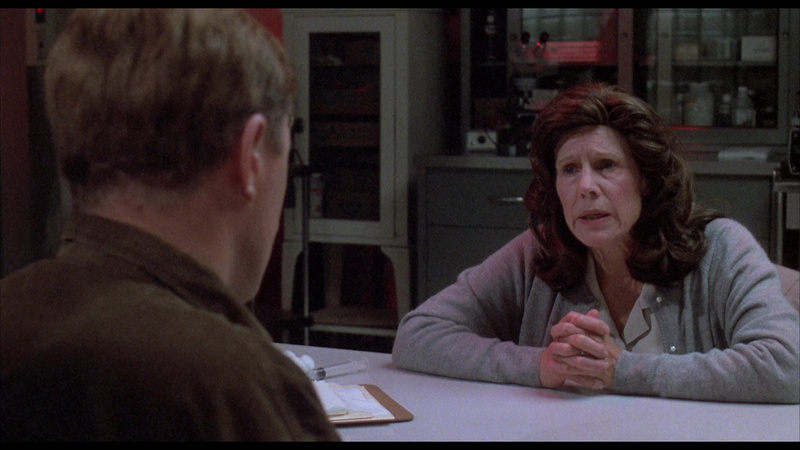 The entire cast is perfectly fine with Gregg Henry and especially Frances Sternhagen getting some juicy supporting moments (her big exposition relay done in one of De Palma's nuttiest long takes is a keeper), but this is really Lithgow's show with the actor playing at least five different (sort of) characters at different points through the film. Exactly who they are and how they fit into the plot won't be revealed here, but it's a ton of fun watching him go full throttle through what amounts to a crazy 90-minute demo reel. As usual De Palma has plenty of fun incorporating and recontextualizing elements of his prior films including the empty shoe gag from Dressed to Kill and the extravagant spit diopter shots from his '70s and '80s work, plus other nods to filmmakers like Alfred Hitchcock (a fun take on Psycho's car submersion) and, most notoriously, Dario Argento's Tenebrae, with its most famous visual trick borrowed here for one particularly outrageous shot (repeated again in De Palma's Passion). Of course there's also the usual De Palma toying with the medium of film itself, this time transferred to television with monitors, TV screens, security camera feeds, and other methods of modern perception playing key roles in the film from a chilling hospital flashback (involving an eerie reflection on a TV screen) to a nifty shock effect on the video baby monitor. 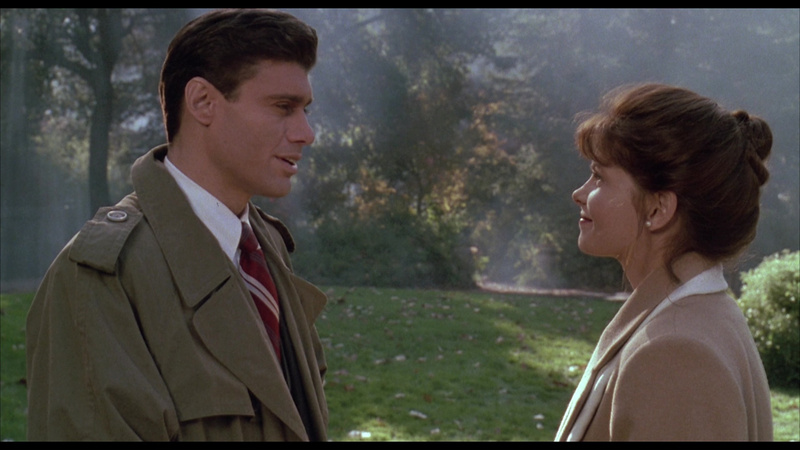 Of course, by now many film buffs know that there's actually another version of Raising Cain that originally bowed online as a fan-created attempt to restore the film's original structure as De Palma's originally wrote it, with Davidovich's story serving as the viewer's entry into the story as a kind of dark, sinister romance that only becomes truly batty and excessive later on with each layer of the narrative gradually revealed. This wildly non-chronological approach (which incorporates a lengthy flashback early on) wouldn't cause an issue today, but this was before the idea of extreme time-shifting games was granted public acceptance with films like Pulp Fiction and Memento. 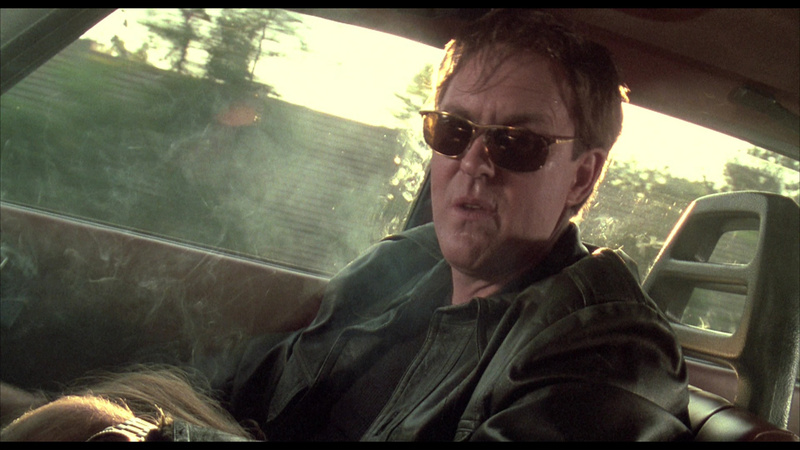 This drastically reshuffled edition, originally posted as Raising Cain Recut, has since been given the filmmaker's blessing and been christened the director's cut, which seems appropriate as it's a stronger way to present the story with a much more accessible presentation of Lithgow's character (who almost serves as background wallpaper for the first act). This may not be the best place to start if you're new to De Palma, but if you're ready to jump into the crazy end of the pool, it's an experience unlike any other -- and both cuts are well worth watching. The theatrical version has remained steadily available on home video from VHS to laserdisc to DVD over the years with only a theatrical trailer as an extra, with an HD version popping up on various pay cable channels around 2013. The film finally bowed on Blu-ray first in the U.S. and then the U.K. in fairly similar but not identical editions from Scream Factory and Arrow Video respectively, both presenting virtually identical presentations of both the theatrical and director's cut on separate discs. (The UK release also has a DVD of the theatrical cut, while the US is Blu-ray only.) The image quality looks excellent and actually a bit more colorful and detailed than the theatrical prints, which were kind of soggy looking (in keeping with the Universal house style around that time). For one of the studio's catalog titles it's especially strong and easily the best this has looked on home video. 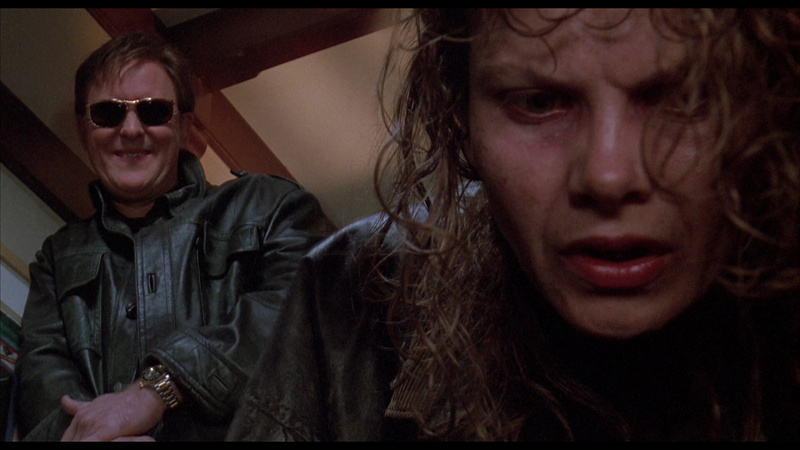 The film doesn't have the same stylistically extreme look as De Palma's prior thrillers (especially Obsession and Blow Out), but for a '90s studio film, it looks pretty impressive. The DTS-HD MA English 2.0 soundtrack admirably preserves the original Dolby mix heard in theaters, while the US disc adds a 5.1 options as well that mainly swirls some of the Donaggio music and a handful of sound effects to the rear channels. Optional English subtitles are provided. Both editions include the theatrical trailer, a gallery of stills and promotional art, and a batch of featurettes: "The Man in My Life" (24 mins.) with Bauer recalling his work with De Palma on this and Scarface; "Have You Talked to the Others?" (10 mins.) with editor Paul Hirsch discussing the film's elaborate narrative and editing construction from page to screen; "Three Faces of Henry" (15 mins.) with Henry sharing stories about his multiple De Palma projects and the director's love of trickery and disguises for his characters; "The Cat's in the Bag" (8 mins.) with actor Tom Bower; and "A Little Too Late for That" (8 mins.) with actress Mel Harris ("Brian's films scare the heck out of me, but I can't stop watching!"). The second disc with the director's cut in both cases has an intro by filmmaker Peet Gelderblom, who first assembled this version and recreated it for the Blu-ray release, and a longer 13-minute examination by him covering how the film's central themes shifting dramatically when the original story structure was restored. The US disc also has a half-hour chat with Lithgow about the challenge and joy of taking on this flamboyant assignment after his prior De Palma films (Blow Out and Obsession), while similar territory gets mined on the UK disc with a different, 15-minute Lithgow interview, "Hickory Dickory Doc." The UK disc also adds two substantial, entirely new featurettes: "Raising Pino," a welcome 35-minute piece with the great composer about his lush compositions for this film and its placement in his classic string of De Palma scores, and "Father's Day," a 23-minute overview of the meaning and significance of the two versions of the film, presented by Un-American Psycho author Chris Dumas and more closely picking apart the details of the second draft that served as a blueprint for this newer cut. A liner notes essay by Anne Billson is also included, and it's also worth noting the reversible sleeve options featuring the so-so Universal poster and an excellent new design by Nathanael Marsh that's easily the most striking piece of artwork designed for this film to date. Reviewed on January 27, 2017.